BEACON FALLS — Woodland wrestler Elias Sturdevant exudes confidence uncommon for a freshman — especially one who has to travel a couple hundred miles each week to practice and compete without teammates from his own school. That confidence, though, means he isn’t exactly surprised by the fact that he opened his rookie season at the 113-pound class with a 12-2 record. But in some ways, he’s performing even a little bit better than his high expectations. Of his dozen victories, 11 have come by pinfall. “That’s a lot better than I thought I would do,” he admitted. Sturdevant feels as though his biggest area of improvement has been his ability to wrestle well deeper into matches — although he hasn’t needed the full 6 minutes most of the time. He’s continued to improve despite the difficult schedule he endures as a team of one from Woodland. Sturdevant’s father, Brian, drives Elias to practice at Thomaston High daily. Because the Thomaston-Holy Cross-Litchfield co-op program is still relatively small, he doesn’t always get a lot of work at his own weight and has to bump up to 120 pounds. Coach John Varanelli praised Sturdevant’s abilities on and off the mat. 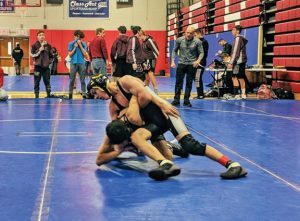 Sturdevant is looking forward to the Berkshire Valley Tournament, which is essentially the combined league tournament for Berkshire League and Naugatuck Valley League wrestlers, during the second week of February. His expectations for that meet once again demonstrate his confidence. “I think I’m predicted to win the Berkshire Valley tournament,” Sturdevant said.